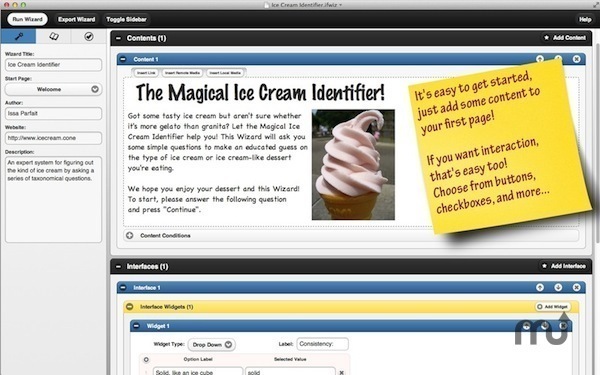 Easily create interactive websites and applications. Is there a better alternative to IfWizard Professional? Is IfWizard Professional really the best app in Author Tools category? Will IfWizard Professional work good on macOS 10.13.4? IfWizard Professional is a patent-pending, revolutionary new approach to knowledge engineering, the science and art of turning human knowledge into interactive problem solving tools. With state-of-the-art innovations and proven techniques, IfWizard makes it easy and fun to create hundreds of different kinds of wizards from games to surveys to traditional expert systems. Special weekend deal: 75% off! Just $9.99 instead of $39.99. Ready with your wizard? With one button you can turn your invention into an interactive web site or standalone application for OS X or Windows that you can run, share, sell, and integrate without any restrictions or licensing fees! With IfWizard you can save, build, and market your knowledge and creativity through the web and as professional desktop applications, all without any programming or technical experience. IfWizard makes it easy to bring the power of knowledge engineering to your business, classroom, laboratory, or home.